In an era where “the customer is always right” (at least they are when they share their stories on social media), it’s easy to overlook just how difficult it is to be a customer service rep. Far from being a glamorous job, CSRs often have to choose between conflicting priorities – resolving issues on the first call, keeping handle times low, and keeping customers ‘happy’, to name but a few. The modern contact center is a pressure cooker, where every minute counts. With this in mind, it should come as no surprise that, just like consumers, CSRs have pet peeves, too. For a change, let’s have a look at what makes for a poor service experience, from the agent’s point of view. There’s nothing more frustrating for CSRs than having to deal with rude or irate customers who take out their frustration on the first person to answer the phone. Of course it’s not the CSRs fault that some unfortunate event transpired (for example, being stuck on hold for an unreasonable period of time) – but it is their responsibility to resolve the issue and turn the caller’s mood around. Often callers simply need to vent about their frustration with a company before any meaningful interaction can take place. Experienced CSRs know this, and will do their best to adopt a sympathetic tone. This one frustrates both customers and CSRs alike: There’s nothing more annoying than navigating a complicated IVR and waiting on hold, only to be told that you’ve reached the wrong department and will have to be transferred (and start all over again). What’s worse, of course, is when you’ve been transferred from the right department, simply because a CSR couldn’t or didn’t want to deal with a particular issue. You can imagine how the conversation will start with the next agent who answers the call. How many times at work have you fixed a problem created by someone else? Imagine having to do it repeatedly. That’s what CSRs often have to contend with. The best ones handle it with grace, solving issues in a way that leaves customers with a real feeling of satisfaction. These are, of course, the kind of employees every call center wants. When you come across theses CSRs in your call center – don’t let them go anywhere! Resolving issues can be a real challenge when callers adopt the position that “the customer is always right”. The goal of every interaction is, of course, to successfully satisfy a customer’s expectations. However that doesn’t meant that CSRs should accept blame for everything the customer believes is their fault. The reality is that customers are often in the wrong about particular issues. A skilled CSR can resolve issues in a way that allows callers to see the bigger picture. After all, sometimes the problem can be as small as a simple misunderstanding. The best companies maximize every opportunity to interact with a customer, and know that the call center offers them the ability to do this with every call. For companies like this, exceeding customer expectations is the #1 priority. 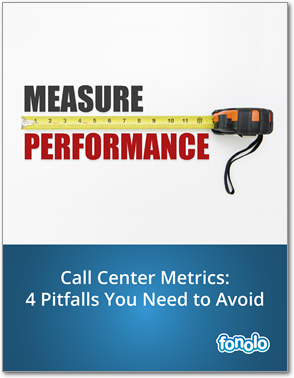 Unfortunately, most contact centers place a higher premium on metrics (sometimes arbitrarily), than on customer satisfaction. This puts CSRs in a difficult position: It’s hard to deliver the best service while trying to get customers off the phone as quickly as possible. Agents shouldn’t have to choose between service and statistics. Of course the good ones will chose … to work elsewhere!